Subjects: History, mountain-climbing, self-discovery, fear, friendship, death, survival. I read Simpson‘s best-seller, Touching the Void, a couple of years ago and enjoyed it immensely. Perhaps „enjoyed“ is not the right word, rather I found it a thrilling and yes, touching, account of the ability of the human spirit to not give up when all hope seems lost. (There was also a lot of bloodymindedness involved). This book is written with the same stylistic skill as Touching the Void, but suffers somewhat from being more of a series of loosely interconnected accounts of separate climbing expeditions and adventures, ending with an attempt to scale the Eiger that would be end up being tinged with tragedy. 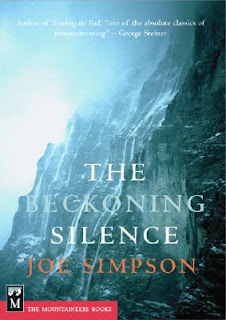 The thread that holds the book together is Simpson‘s growing realisation of his mortality, the discovery that he doesn‘t really enjoy mountain-climbing any more and his quest for an equally thrilling pursuit to replace it, one that doesn‘t have quite the same kind of death toll. He describes various climbing expeditions and his experiences with paragliding, the sport he chose as a possible replacement for the climbing, and ends with his attempt, with a partner, to climb the technically difficult and lethal north face of the Eiger in an attempt to finally finish a climb he had wanted to do since he was a novice climber. Simpson had read Heinrich Harrer's history of the attempts and description of the first successful ascent of the north face, The White Spider, as a teenager and this had kindled his interest in mountain-climbing in the first place, so this was a fitting climb for him while winding down his climbing activities. It also deals with his recovery from the injuries he sustained in the accident described in Touching the Void and a later climbing accident that's described in This Game of Ghosts (another one for the wish-list, along with The White Spider). This is a book for mountain climbing enthusiasts and armchair adventurers alike, and while there is a considerable amount of technical jargon in the book, especially when describing equipment and climbing techniques, it is still accessible to people like me who have never strapped on climbing gear and gone mountaineering. I also came away from it with a number of titles of mountainerring books I would like to read.